Read here about tensegrity structures composed of three struts, part of a series of pages organized by strut count. 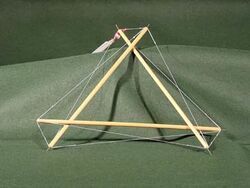 The 3 strut tensegrity prism is considered the simplest tensegrity structure. Below, gallery of 3 strut images. A 3-strut prism by Fuller, its filament probably dacron, is on display at the Stanford archive. 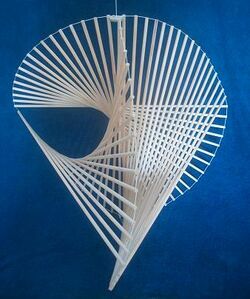 A 3 strut tensegrity by Fuller. Stanford archive photo. A 3-strut tensegrity by Fuller, forming a triangle. May have been used to illustrate that even a "polygon" triangle is an ultra-flat tetrahedron. 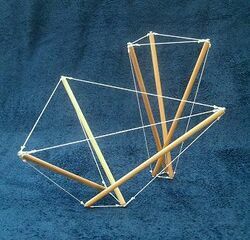 3 strut tensegrity by Fuller, forming a triangle. Stanford Archive photo. 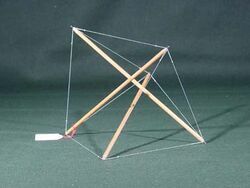 3-strut tensegrity prism, from Fuller's Tensile-integrity patent number 3063521. 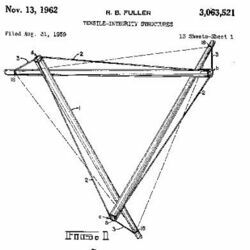 Fuller Tensile-integrity patent number 3063521. 3-strut tensegrities, in two tensile arrangements. Constructed, and photo, by Marcelo Pars. 3 strut tensegrities by Marcelo Pars. 3-Strut prism, computer rendered by BenFrantzDale and published wikipedia. "3-Strut CAD with Shadow by BenFrantzDale.png." A carbon nanotube 3 strut prism is proposed. The three carbon nanotubes are covalently tensioned, or tethered, at their cap pentagons by polyethylene polymer chains, by Needham, Wilson, and Yakobson. See Buckminsterfullerene for more information. 3 strut shade by Armin R. KachelShade Structure. The 3 strut prism can be used as a tripod, supporting an object. 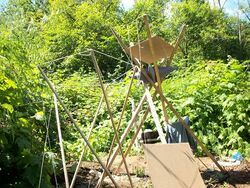 WV is a veteran user of tensegrity structures for camping. He has deployed tensegrity hammock stands. 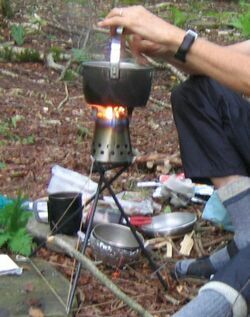 Below, a 3 strut tensegrity stand he built supporting a Bushcooker LT II stove. Photographed by WV while camping at Laurel Fork Wilderness, August 2010. The 3 strut construction may be repeatedly applied to construct larger tensegrity structures. Below, 10 repeated 3 strut modules, by Fuller. 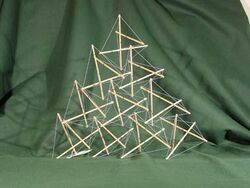 Fuller created this pyramid of 3 strut tensegrities, yielding a 3x10 strut tensegrity. Photo, Stanford archive. 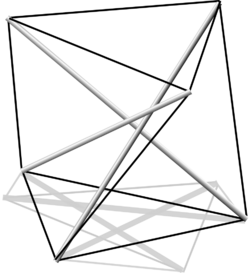 Below, the Sixty Strut Tensegrity by Fuller, composed of a repeated three-strut module. The 3 strut is repeated as the 20 faces of an icosahedral tensegrity. 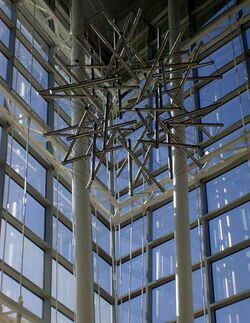 Photograph of Sixty Strut Tensegrity Sphere, University of Wisconsin, Madison. 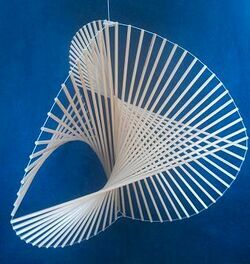 StructureMode, an engineering firm, repeatedly used the 3 strut prism to construct a torus that conforms with the perimeter of a hyperbolic paraboloid. 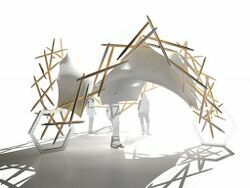 For more information, see Tension Pavilion 2016. A 3 strut tensegrity has been constructed from DNA strands by Seeman's team. Below, a stereoscopic image. 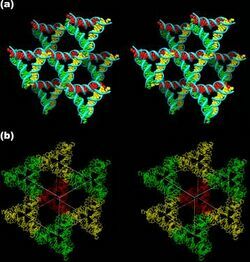 3 strut tensegrity prisms formed by DNA. By Seeman. In an alternate construction method, each structurally essential strut is repeatedly implemented. The new strut is redundant, structurally. Visually, the redundant struts articulate various forms as they apread out and away from one another. Pars experiments with this implementation; below two photos from his website. 3x17 strut tensegrity hanging. Construction and photo by Marcelo Pars. Karl Ioganson may have constructed a 3 strut tensegrity prism in the 1920's. A video of a 3 strut chime is posted at Musical Instruments.